For over a decade, Oxford University Press has asked its staff and online community to help it choose a Place of the Year. Past winners have been as varied as our lost ninth planet, Pluto, and the host of the 2010 FIFA World Cup, South Africa. This year, each of the four places on the short list was important for its own reason, but one stood out among them. 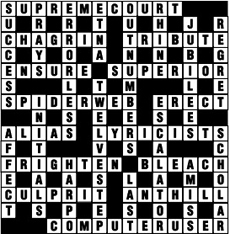 Complete the crossword puzzle and unscramble the letters in the shaded boxes to spell out the chosen 2017 Oxford Place of the Year. 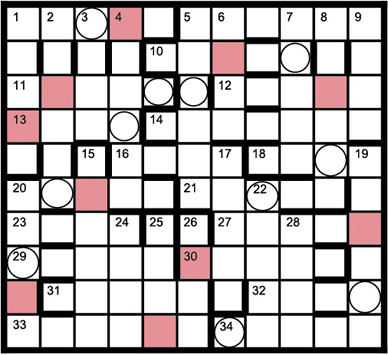 One Across answer in each row must be altered to fit in the grid, forming an unclued entry in one of two related categories. When the grid is filled, the circled letters, read left to right, will say where these new diagram entries appear, ultimately. Enumerations for the Across entries are withheld; Down entries are normal. Good luck! ACROSS 1 anag. 9 CHA[t] + GRIN 10 TRI(BU)TE 11 ENSU(R)E 12 S + UPERIOR (our ripe anag.) 14 anag. 16 final letters 17 ALI + AS (&lit.) 18 L(YRIC)ISTS (I cry anag.) 20 F(RIGHT)EN 22 B(L)EACH 25 CUL(PRI)T 26 AN + TH[r]ILL 27 anag. DOWN 1 SU(C + C)ES + S 2 “praise” 3 letter bank 4 rev. 5 OUT NUMBERS 6 anag. 7 “Jew, Belize” 8 REGRE[e]T 13 T + W + ELVES + TEP (rev.) 15 I + NITIALS (is Latin anag.) 16 anag. 17 A(F + FE)CT 19 SC(HOL[d])AR 21 rev. 23 A MISS 24 2 defs.